Texas Burger Guy: Watch the TexasBurgerGuy on the Food Network!!! Watch the TexasBurgerGuy on the Food Network!!! 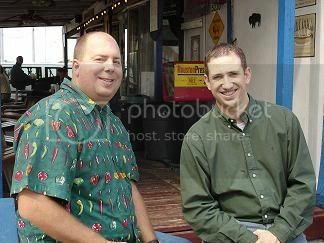 Ever wondered what the TexasBurgerGuy looks like? You probably think I am an 800 pound mammoth... maybe you are right. Maybe you think I am a 13 year old teenage boy just messing around on daddy's computer... maybe you are right. 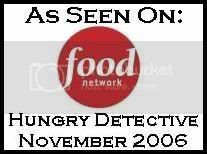 Well TBG readers... wonder no more because on Tuesday, November 28th at 9:30 pm CST... you will have a chance to see me on national TV as I will be on the Food Network's show "Hungry Detective". Here is how it all happened... 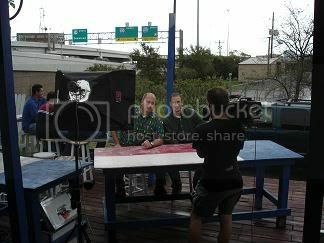 In October I received an e-mail from a producer at the Food Network asking me if I would be interested in being part of the Hungry Detective show they were filming in Houston. They used my website to find the burger joint they were shooting at. I gladly accepted. We filmed on a really wet day in mid-October at Bubba's Texas Burger Shack in southwest Houston. If you haven't watched the Hungry Detective... it is a great show! The show is hosted by Chris Cognac. Chris works as a detective for LAPD. He was asked to do this show where he uses his detective skills to find off the beaten path restaurants. He used my website as one of his leads in finding an off the beaten path burger joint in Houston... thus the reason they asked me to be on the show. Here is Chris, the host of the show with some dude. Here is the whole crew with the same dude hanging around. 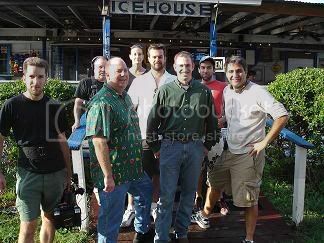 Chris is in the front left and the guy in the white longsleeve shirt and khaki shorts to the right front is Sean O' Malley... the producer of the show. Sean is an exceptionally nice guy! Here is where the big eat and chat shot took place... getting ready for it. The crew was getting the kitchen at Bubba's ready for the shot back there. 2 TBG Readers got an insiders tip about the show filming at Bubba's and they showed up to see what was going on... they ended up getting filmed for the show!!! Chris and Sean discussing one of the shots. It rained like crazy during the day so the crew took refuge on Bubba's deck. This was immediately after the chat and eat shot... it was pouring down rain!! All in all I will never EVER forget this opportunity. It was fantastic! I also have a new found respect for what goes into putting together a TV show. The segment I am on is 7 minutes long and we shot at Bubba's for 7 hours! Sean and his crew were top notch! Chris Cognac is an amazing guy! He and I sat around and talked about what else but food all day. I hope that you will tune in or Tivo the show on Tuesday, 11/28 at 9:30 pm. I will try and pull it off my Tivo and put it somewhere on the web so you can view it if you miss it. Pretty neat. I know Trey and Jason and looking forward to the episode tonight. Sweeeeeet! Can't wait to see it tonight! im watching it right now. thats so cool!! Nice Job, just got finished watching it. Bubba's was a GREAT choice and you did a great job. They're really picking shots that make Houston look good. I'll be sure to add a link to this post and add you to my bloglinks to keep up with what you review going forward. nice site you have here. I'm a fellow blogger and website owner and I happened upon the show tonite. I don't really read many food blogs, but when I heard some guy on the food network talking about a blog I had to check it out. From a webmaster point of view I'm really interested to know how the airing of the show affected your traffic. keep up the good work. Man! I missed it! But I am recording the encore showing later this evening. Saw the show - Great job! My husband and I saw the show last night. We live near College Station and consider ourselves burger aficionados. We were happy to learn about your blog and will be regular readers now. Loved the show -- will definately have to get some burgers next time I'm in town. I had the opportunity to work with the guys in Boston twice, and was able to get some great video footage behind the scenes. Great show! Can't wait to see where he goes next season. Had to take the videos down (since evidently they are protected by foodnetworks legal clauses (somehow). Anyway, the pics are still up. TBG, you are the pimp of burger reviewers. Whoa, found your site, then was reading about the Food Detective. Looked familiar, then I realized it is Chris Cognac. I used to go o High School with Cognac! Your burger reviews are great, btw. Any Austin reviews? congrats on the TV appearance! 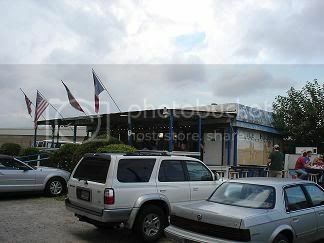 Hey guy I want to say guy this is my first comments watch the Texas brger Guy on the food network. 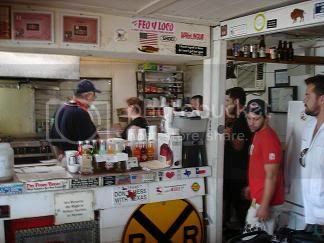 yOU MIGHT WANT TO TRY A BURGER AT THE WHISTLE STOP IN DECATUR TEXAS. HOME MADE PIE TOO.